Neck breaking – If I had a dollar for every time I see a movie or read a book or watch TV and someone with their arms or legs snaps the neck of a bad guy and kills them… Sometimes they just put a hand on either side of their head and jerk and you hear a chiropractic snapping sound and the person falls limp and dead. We would all be dropping dead regularly if it were so easy to break our necks. In reality, a broken neck is much harder to achieve as the neck can flex easily. Even crushed vertebrae would not be an instant kill. If you lift and rotate the Atlas joint you can damage the spinal cord through spiral tear or at worst sever it, very difficult the latter. Still, the victim would most likely be paralyzed but not die immediately. Even severing an artery will cause death only after a few minutes. It is unlikely even the strongest man can snap the neck of a bad guy and kill them instantly. Knocking Someone Out – Even people with a “glass jaw” can rarely be knocked unconscious with a single punch or blow to the head. Look at boxers. After a long fight, they often succumb to a rain of blows. A kick to the head on the other hand, may do the trick. However, the heroes punching a guy in the jaw, not likely to do the trick. Recovery from Being Knocked Out – If you are knocked unconscious from a blow to the head, most likely you have suffered at least a concussion if not a traumatic brain injury. You do not get up, rub your head, and then act functional and remember what happened. When knocked out, you lose the last thirty seconds to few minutes of memory. If you were knocked out quickly, you would wake up not even knowing why. You would also experience headache, vision issues, and nausea. This state would continue for some time and you would need medical assistance. If you had bleeding on the brain, cerebral swelling, or organic brain injury, simply ignoring it will cause the damage to be permanent, worse, and perhaps fatal. If your hero is good, and does not kill anyone, they simply knock them out. In reality, there is a good chance that hitting them over the head hard enough to cause loss of consciousness will not only cause severe damage but maybe death as well. Sleeper Hold – The good hero often does the sleeper hold. This again is easy, simply holding them gently with an arm until they pass out. In reality, this can often damage the trachea and cause suffocation and heart attack, even in trained professionals. How many times have law enforcement been sued over choke hold related deaths? Also, it takes a long time to make someone pass out, in which they turn blue, eyes bulge, and they fight like hell to stop you. I get so tired of “don’t fight it” being said during a choke hold to make it easy. The truth is that when you are suffocating, you WILL fight it whether you want to or not. It is a primal instinct. These scenes would result in about four minutes of horrible struggling, blood vessels popping in the eyes, mucous forced from the nose, and not very heroic for our good hero. Temporary Amnesia Caused by Blow to the Head – If you have physical trauma induced amnesia, it is likely permanent due to the severe damage to your brain needed to induce memory loss. Psychological trauma, such as PTSD can result in temporary suppression of memory or memory loss. Sometimes these memories can be regained. However, a physically damaged brain causing memory loss is unlikely to recover. Regaining Memory from Another Blow to the Head – In Three Stooges tradition, you lose your memory from a head injury, then you regain it from another blow to the head. Each time you get hit, your brain will take more damage. All brain surgeons know the best way to heal damaged neurons is to smash them with a blunt instrument – NOT! And yet this mythos endures, even on famous shows. Psychological Trauma – The hero’s base is attacked and half the people die. They fight back, overcome and end up defeating the enemies. They have a tearful funeral, talk to the family of the dead, and get drunk. Next week they are all back at work as if nothing happened. In what world does your office place have several long time members killed, you kill others, then you return to work for more. Likely that whole unit would be faced with 90% absentees due to leaves of absence, transfer requests and people quitting. Even in the military no unit in wartime withstands 50% casualties and continues to function after that. Even with ten percent casualties, the unit would have severe personality changes and replacements would be viewed as outsiders for not having shared the trauma. Capillary Bleeding – The head bleeds like the dickens. In the military we are trained to avoid people going into shock. Scalp capillaries will cover the entire head and face with blood very quickly from even a minor scratch. 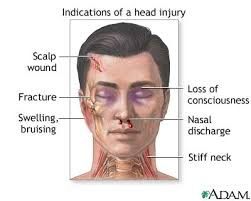 The injured will often think their entire head has been blown apart. A tire iron to the head or a grazed bullet to the scalp does not produce a smudge of blood in the hair that one puts their fingers to and shrugs off. They would instead be unable to see for blood in their eyes and if they clear them to look in a reflective service they would see themselves covered in blood and usually freak out. In these situations, the brain often sends them into shock, shutting down their ability to function and possibly causing death as it shuts down thinking it must preserve blood.